This one goes out to all the traditionalists. 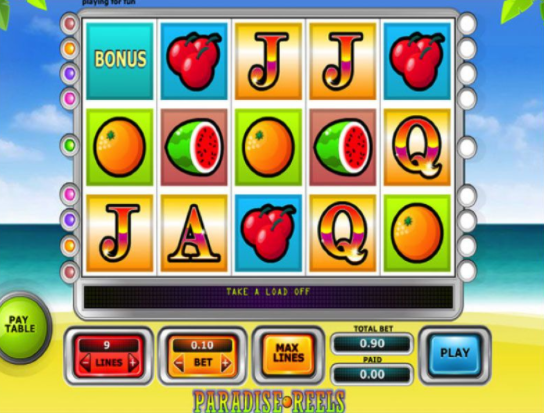 Paradise Reels is your standard fruit machine 5 reel. It features all the regular culprits, sweet double cherries, juicy watermelons and an orange for a bit vitamin C. Enjoy the upbeat soundtrack while imagining yourself on the beaches of the Costa Del Sol playing these cool games! For more similar games, click to see these slots online. experiences separate them from the pack. Their slot games can leave you in a lull. Paradise can be described by many to be a wide list of personal outcomes and locations. To some, that is serenity via beaches, palm trees and coconuts, and to others, it is Eyecon’s online slot Paradise Reels. This 5x9 reel slot is as beautiful as it looks with all the perks of having a great in game design as well as intense functionality that is sure to leave players in a sense of wanderlust and wanting to learn more. Over-looking a clear blue sky and white sandy beach Paradise Reels relies very heavily on its title of paradise. This is a very vintage like a slot with a dreamers perspective on what a vintage slot would look like via the warm confines of a tropical paradise. Warm background music and easy gameplay make for a rather memorable experience that will get you buying a ticket to this island almost instantly. Indeed, Wizard has set their standards high by picking only the best-rated slots to play. Symbols take the shape of some online slot classics. A’s, 7’s, K’s, watermelon’s, Q’s, orange’s, J’s and cherries can be found across each of the pay-lines, all offering a different pay-out depending on what and where you are matching the symbols. The highest paid symbol in Paradise Reels is the A symbol, which will pay 5,000 points for 5 symbols matched. K is just behind A awarding the player 2,000 score for matching 5 of them in a row. And finally, you have the Q symbol which offers 1,000 scores when matched. The gameplay of Paradise Reels is as simple as it is addictive. Players can select their bets based on personal preference. Stakes can be placed from as little as 1p with an auto-play feature being ever-present to allow players the chance to play while doing other things as the game plays within the background. The kiwi Wild logo picture is the key to higher combinations, matching the kiwi will substitute all symbols found across the reels. Another symbol to look out for is the half coconut, matching this will trigger the bonus round. When combined in a winning line, you will be whisked away to a sunstroke beach setting where the coconuts have kept hidden even more multipliers. A very strong wind has just passed along the beach, causing the coconuts to fall onto the yellow sand. This is just what you will find in the bonus game; 8 coconuts spread on the beach. Your aim in this round is to match 3 corresponding symbols to win bonus points. Simple. If you didn't have any luck with this slot then why not now try our irish luck slot? !